You are currently browsing the archive for the 20/21th Century category. 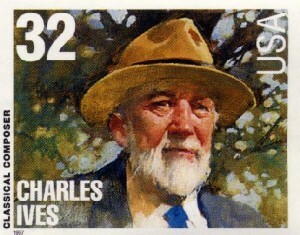 Charles Ives (1874-1954) was born in Danbury, CT, studied organ and composition in New York, but got employed as insurance agent, a job in which he was quite successful. Composing became an activity for his spare time. Because his income did not depend on his musical activities, he was able to do whatever he liked. That he did, indeed. In fact, he did that so fanatically that contemporary musicians and composers could not (or did not want to) really understand what he was doing. ). It takes three conductors to perform the work. Another main theme throughout Ives’ career is his interest in well-known American melodies. This involves church songs as well as folk songs. In about all of his compositions these melodies are incorporated in one way or another. In the fourth symphony, his largest work, dozens of melodies are used, from “Nearer, My God, to Thee” to “Home, sweet home”. Ives was not really popular during his lifetime, but after his death this changed completely. Apparently, it was only then that other musicians and composers got interested in things that Ives did already years earlier. He had been far ahead of his time. It was only in 1965 that his fourth symphony was performed for the first time. He did not hear it himself. Nowadays, Ives is regarded one of the first major American composers. If we go back in history in search of the beginning of classical music, Gregorian chant appears to be one of the most important sources. According to traditional knowledge, it was Pope Gregory the Great who composed the melodies for the liturgical texts of the catholic church. Gregorian chant is named after this Pope, who lived around the year 600. He is often depicted with a dove on his shoulder. This dove is a symbol of the Holy Spirit, who whispered the melodies into Gregory’s ear. As usual, the story is nicer than the history. There was not just one tradition of monophonic liturgical singing in the Middle Ages. Instead, there were many local traditions. In the eight century, the Frankish king Pippin III wished to harmonize all liturgical chant in his vast empire with that of the church of Rome. His son, Charlemange, continued this policy. Thus, the tradition of Rome became very influential. The Roman chant books that were copied by the Frankish scribes named Gregory as the composer of the melodies. It is very well possible that these Roman books referred to Pope Gregory II instead of Gregory the Great, but the Franks assumed the latter was meant. This made the chant tradition of Rome the standard for the entire Western church. The chants we know from Roman sources are, however, not the same as the chants in the Frankish copies. Probably some alterations were made during the dissemination of the melodies across the vast Frankish empire. The exact history of Gregorian chant is therefore still obscure. Starting form the ninth century, we find indications of polyphonic singing in the historical sources. To the Gregorian melody one or more other parts were added. Initially quite simple and straightforward, but as early as 1200 in the Notre Dame at Paris, very complex compositions were made. One example is the Alleluia Nativitas by Perotinus. ). The genesis of these early polyphonic compositions can be considered an important starting point of western classical music. After the Middle Ages, Gregorian chant kept its influence. Except for being the ‘breeding ground’ for later styles, the melodies themselves were used often in all kinds of compositions. Let’s have three examples.